Parents’ first concern for their children in winters is that they should wear comfortably and warm clothes. However, nowadays kids are getting more conscious of what they wear. They tend to wear trendy and fashionable clothes just like their friends. In case they wear normal dresses then they met get into inferiority complex. Keeping your kids’ closet with new and trendy clothes will boost their morale and confidence. You need to get jumpers and cardigans which give warmth to your kids and are comfortable at the same time. 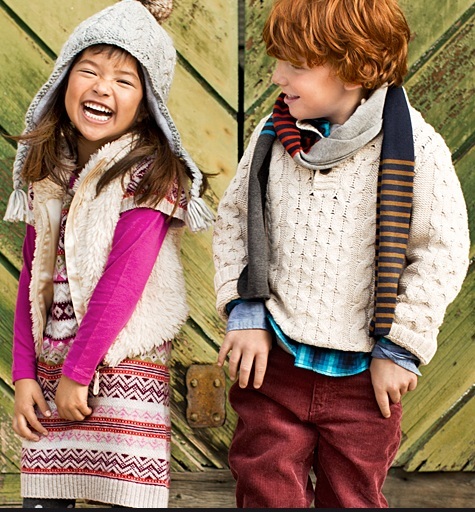 You can get chunky knitted sweaters for both boys and girls which are comfortable. You can get stylish coats and jackets for your kids. Get either bright colour jackets for both boys and girls. You can also get army style jackets or duffel coats. Get jeans which are most common for straight leg style. Corduroys can also be worn by both boys and girls as they are warm. During snowy season, surf trousers are trendy and warm at the same time. You can also get your children any style of jeans but make sure they wear a legging underneath so they can keep their legs warm all the time. You can get bright coloured accessories for your children. You can get hats, caps, gloves and scarf of different colours. Black coloured accessories will also look cool on your kids. Fingerless gloves look cool as well along with woollen beanies. You can get trousers and jumpers of tweed. These look trendy along with providing warmth to your kids. Get lace up boots for your kids. Also prefer leather boots which are more waterproof than other boots. You can also get your boys or girls wellies. You can get coloured woollen tights or leggings for your girls. Girls can also use brightly coloured macs. On the other hand, stripped long-sleeve shirts with jeans are trendy for boys. Checked shirts for boys and girls look great under coats.